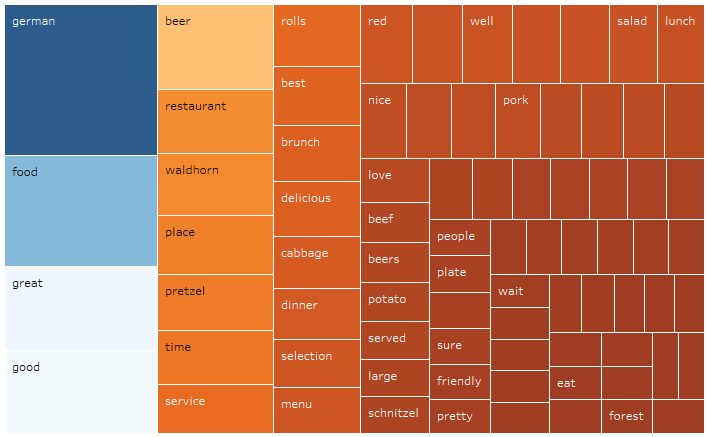 Nice and thorough, with each box sized in proportion of the use count of the word. Unfortunately, the average consumer of such analysis is struggling to interpret it, as this style of viz is probably not mainstream enough yet. It’s still way better than the dreaded pie chart, which is impossible to consume with more than 3 slices. 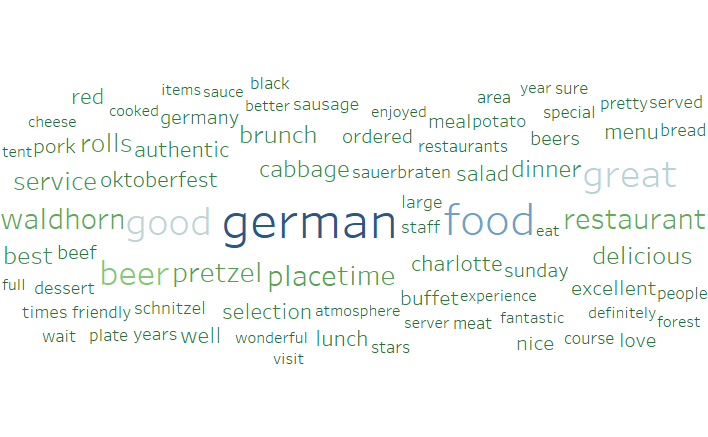 With one quick glance, one can clearly visualize that those reviews cover a German restaurant in Charlotte, NC, with a fairly positive tone. 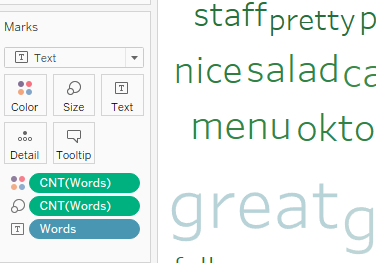 Soon after I got started putting together the Word Cloud, I realized that Tableau offered little guidance on that topic. Word Cloud is not found in the Show Me tab for instance. I searched what fellow bloggers had to offer, and easily found some guidance, like here or there. 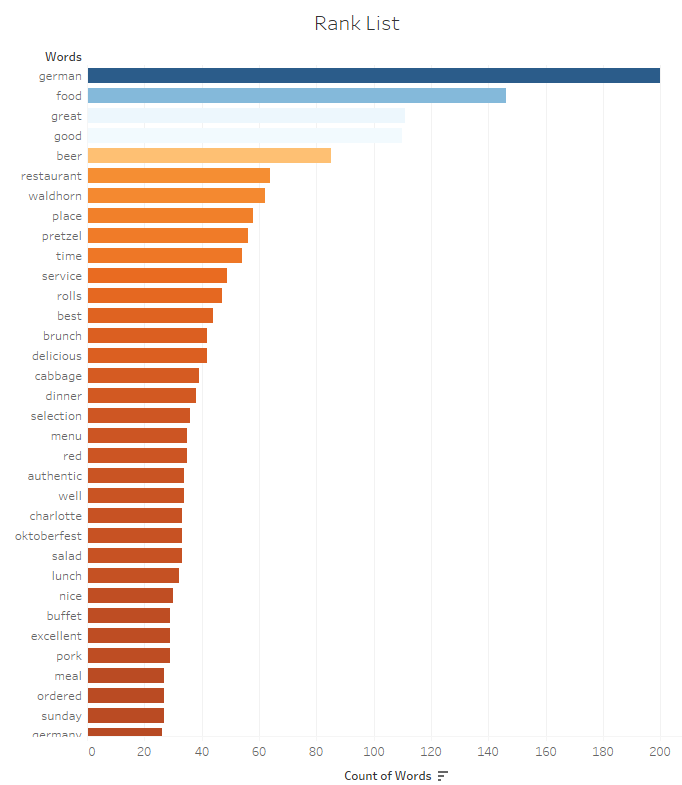 These are all fine posts, with nice visual steps to follow, but they overlook a crucial point: they assume that the data set has already 1 word per column, which is highly unlikely to happen. 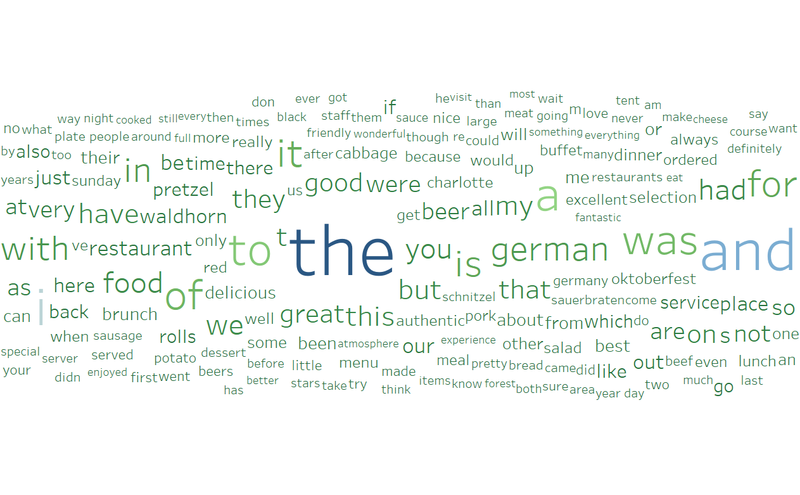 It turns out that using a data source with sentences instead of single word, is a major road block to the use of Word Clouds in Tableau, as reflected in some help requests in the community. 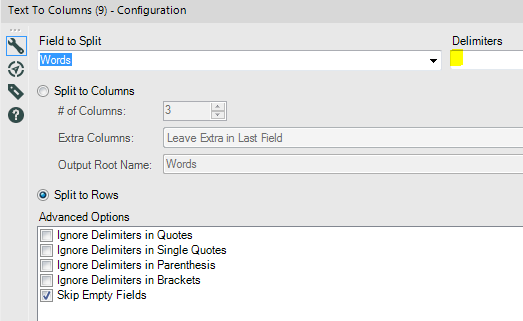 In order to feed Tableau with something workable, it requires to split the words of the reviews column. This operation implies breaking the granularity of the data source, which will expand the number of rows by the number of words found in each review. 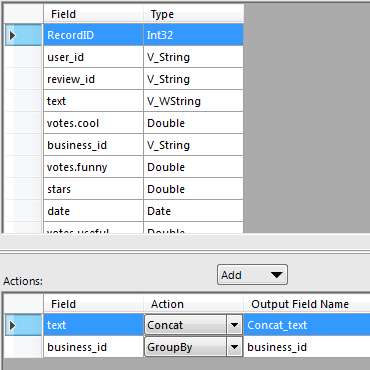 There must be ways to code that conversion in Python, R, SQL or even PowerBI DAX. 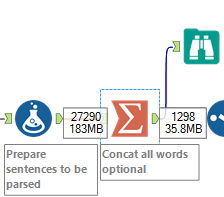 But as often for me, for a clean repeatable solution without dreaded copy + paste, whipped together in 10 minutes, I will use Alteryx! Notice the granularity along the workflow: we start with 27,290 rows and after the split get to over 3 million rows! This implies that the average review comprises 123 words. That workflow takes 1 minute to complete on my laptop. I load the Excel file, originally a CSV, then take out the Type field, since they are all reviews, and take out empty reviews by filtering them out, just in case. 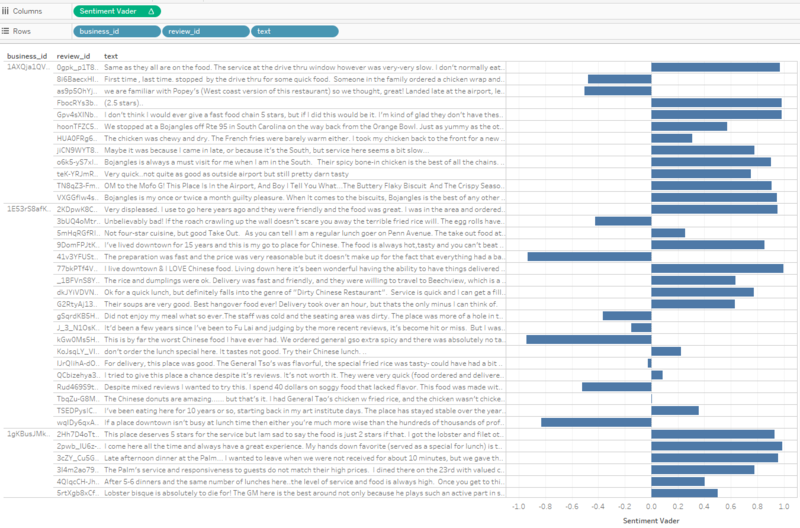 The blue box called All Sentences is a barely modified Tableau output I will use towards the end of that blog post, to use sentiment analysis. I will start with the Word Cloud fork which ends up with a pink box called Word by Word, my goal here. by applying those 4 steps in succession, I obtain a Text cell which contains only lower case words surrounded by one space. If I don’t convert to lower case walking and Walking will get separate counts. 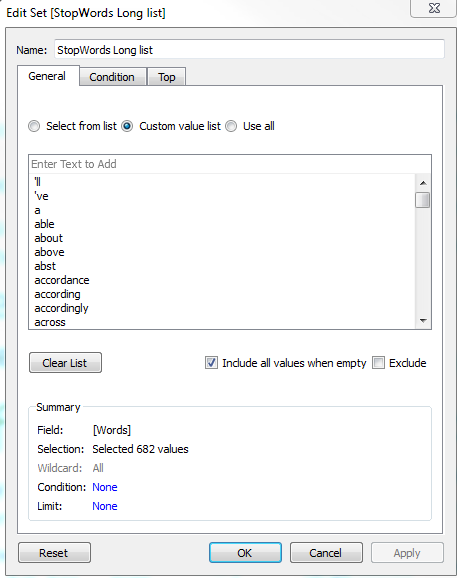 It will take every row and split every Text cell by the number of words, using space character as a delimiter, as highlighted above. and proceed to drag the set into a filter for my viz, of type In/Out, which you will set to Out, to take out all of those meaningless words. The beauty of this approach is that you can easily tweak that list in the set, based on what you see, and play around with various lists. This is the artistic part of the analysis! The results make a lot of sense, even though the integration of Python in Tableau is not for the faint of heart. Novices better keep out! 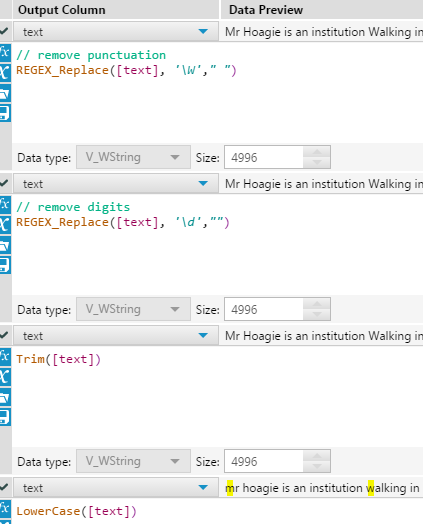 I am looking forward to the implementation of Python in Alteryx, which will be smoother as the calculations will need to be performed only once during the workflow run, rather than waiting for 5 minutes each time the viz is modified in Tableau. This entry was posted in Alteryx, Tableau and tagged Alteryx, Tableau, word cloud. Bookmark the permalink. Great article! I would recommend using a calculated field which replicates all of the cloud words but with leading and trailing spaces. Two spaces (or a different number as desired) on both ends will greatly improve the readability of the cloud.